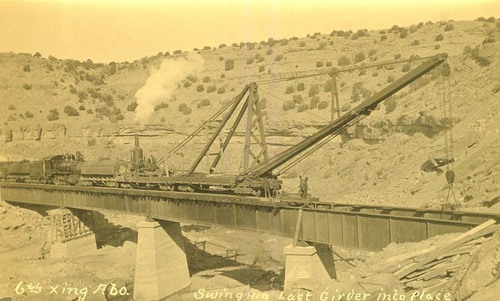 This view shows a construction crew from the Atchison, Topeka & Santa Fe Railway Company swinging the last girder into place on the sixth railroad bridge crossing at the Abo River in Abo Canyon, New Mexico. Also visible are a railroad locomotive, and railway construction equipment and supplies. Construction on the railroad bridges, tunnels, and tracks in Abo Canyon begun in 1905 and was completed in 1908.